Is your campaign aimed at growing revenue, improving customer experience, increasing brand lift, or maybe improving marketing effectiveness? It’s essential to nail down your goal and make it specific. For example, if you want to grow revenue, your campaign goal might be to increase client retention by 5% in the month of September. Remember, clear goals lay out a target (5%) and a timeline (September). No piece of content, no matter how fabulous, will work if it isn’t audience centric. To achieve that, you need to be crystal clear about who your audience is. If you’re improving customer relations, it’s your customers. If you’re working on brand lift, new audiences and customers may both be key. But for a content campaign, you also need to understand the buyer journey…and target content, and calls-to-action, for each step. Understanding what your audience needs, and what will lead them another step forward, is key . Don’t forget to think about their pain points. One of our favorite questions is: What keeps person X up at night? If you can answer that, and align your brand with the solution, you can begin moving them through the journey toward your brand. There are a zillion different metrics out there to pay attention to. But they don’t all matter all the time. So the question is, which metrics will give you the information you need to make sure your campaign is on track? The answer is, choose the metrics that speak to your goals. Tracking revenue? Then sales, leads, and upsales will tell you want you want to know. Tracking customer experience? Consider sentiment and influencer engagement. And establish a cadence for reviewing metrics – cadence will, in part, be driven by campaign length (longer campaigns check in on metrics less often than quicky campaigns). But don’t wait until the end when it’s too late to adjust—the real value of metrics is the ability to adjust as you go. We love a good brainstorming session. This is a great way to align topics with your audience pain points and narrow down ideas your team can coalesce around. If you have access to content intelligence to add data to your decision making process, that’s even better. Align your topics with the needs of your audience and consider emotions and take-aways as you narrow down topics. Choose topics you’re confident about, things you know your brand can speak to with genuine authority. And think of how you want prospects to feel when they encounter your content: scared, empowered, hopeful? Focusing on emotions can help craft take-aways that align with goals. So, for example, if you’re goal is to drive sales leads, you might want to craft content around fear of being left behind, or urgency to move forward sooner. Your take-aways should promote the emotion and prod the audience to take a concrete action. A great way to start a campaign is with one large piece of content: a whitepaper, an ebook, an app. The goal of the main content piece is to give your audience something of real value that addresses their pain points in a substantive, informative way. For most brands and goals, tying content to keywords helps flesh this large piece out and drive it toward success. This has been coined 10x content – content that is ten times better than anything else found on search. You’ve got the content, large and small, and now it’s time to share it. 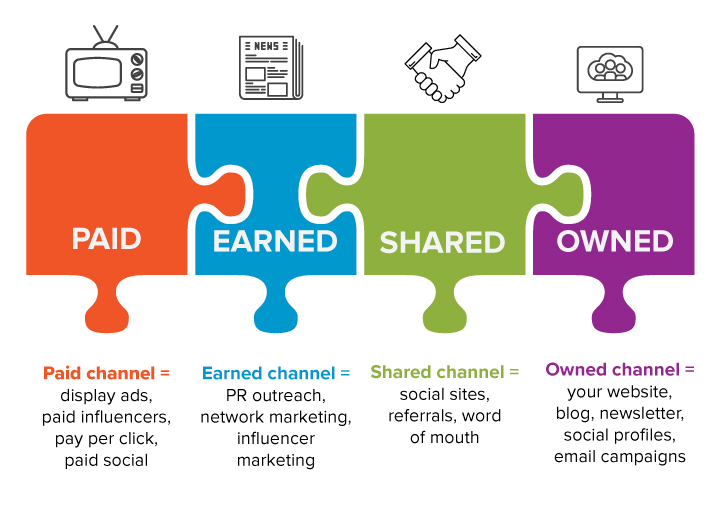 You’ll want use all your promotional channels: paid, earned, shared and owned. A campaign that uses all four channels is more likely to drive success, no matter what your goal. You’ll also want an editorial calendar for your campaign so you know what content is being shared on which channel when. Editorial calendars can also include task assignments so you know who is doing what when and nothing falls through the cracks. Make sure your silos aren’t in the way of success – your sales team, for example, might want access to key assets. The work doesn’t end at launch: Once your content is out in the world, you’ll need to nurture it. Remember those timed metrics? They can help you at this stage – review what is and isn’t working so you can adjust and improve as you go. Things like headlines, images, and timing can be AB split tested and improved throughout the life of the campaign so you’re maximizing each interaction.